Larissa Behrendt’s latest work is a profound lesson for the gullible. Finding Eliza calls out narrative tricks that have been deployed with colonizing affect by white writers, artists, and legal authorities, not least dramatically those about cannibalism. Drawing on her background in law and fiction, Behrendt guides the reader deep into the unsettling pathos of colonial fantasies and myth-making in Australia. The story of Eliza Frazer – a white woman who was shipwrecked in 1836, and then spent several weeks with the Butchalla people on Flinders Island off northeast Australia – provides an entrée for Behrendt’s core argument. Narratives colonize. 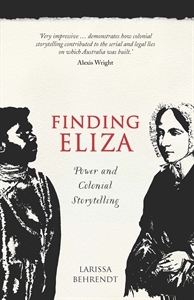 Eliza’s alleged capture by cannibals enthralled 19th Century audiences, and functioned to reinforce stereotypes of Aboriginal people as ‘barbarous’ and therefore in need of white civilization. As Behrendt admits, she’s by no means the first writer to enter the murky territory of the ‘actual’ and ‘fantastical’ accounts of cannibalism. Names as big as Sigmund Freud have made comment on the perversions embedded in European’s cannibal stories. 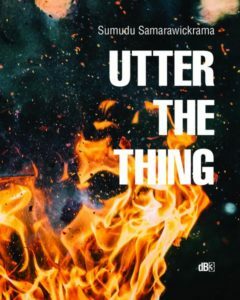 Published, too, 15 years after Tracey Banivanua Mar’s interrogation of cannibal tropes of Pacific history, the imperatives behind the book remain pressing. [ii] It’s not only the enduring repetition of narratives about ‘native’ cannibalism that are of concern, but the material forces behind them. For, Behrendt reminds us, white writers continue to profit from narratives where they imagine Aboriginal people as objects of knowledge. In each chapter, Behrendt offers her readers subtly different angles to view and reflect on the colonizing operation of stories. From Eliza’s stories about Butchalla cannibalism, she turns to the enduring popularity of cannibal stories in Defoe’s Robinson Crusoe, and later, to the story of Elizabeth Durack, a white woman who, in the 1990s, fraudulently pretended to paint as an Aboriginal man, ‘Eddie Burrup’. Through these narratives, Behrendt exposes the ways in which blurring the line between fact and fiction has assisted white men and women to indorse their power and feign innocence, and make a buck (or many) along the way. The opening chapters are a productive dialect between 19th Century historical narratives and critique thereof, all wrapped in cogent prose. As I entered the world of flesh-eating fantasies, I felt a swelling curiosity about why Behrendt was drawn to unpick narratives about Eliza Fraser; an historical character I found unarresting, if not annoying. (Admittedly, this may be because Eliza ‘mirrors’ an uncomfortable reflection of my own white woman-ness, to use Behrendt’s term.) But this book is not really about Eliza, or her likability. There’s more at stake in this interplay between narrative and its deconstruction. Something at once political and personal. Given the book’s persistent critique of colonial narratives, it’s not entirely clear whose hearts and thoughts Behrendt hopes it will remould. Despite the contemporary resonances of the figure of Eliza Fraser, and of the ‘classic Aussie’ 1976 film named after her, I’m not sure the book will attract readers who aren’t already invested in critiquing colonialism. Yet it’s the book’s model of vigilance that makes it so instructive, a valuable resource for thinkers, writers, lawyers, anthropologists, historians, and students. This is a book to reflect on, keep, and return to. It guides readers to realise the interconnectedness of history, law, literature, art, stories and colonial power. Toward the end of the book, Behrendt drives home the ‘so what?’ of her argument for the need to call out the colonizing potential of storytelling. In 1993, she tells, the Yorta Yorta people became the first people to lodge a Native Title claim. Justice Olney of the Supreme Court denied their claim, asserting the Yorta Yorta were ‘no longer a traditional culture’. Then, in early 2004, a Yorta Yorta spokesperson, Henry Atkinson, asserted a counter narrative; ‘All societies evolve, some through their own progression and others because they are forced to.’ In April that year, the state invited the Yorta Yorta to enter a co-operative management agreement as a means to ‘involve’ the Yorta Yorta in the management of their own land. [vii] What legal matter are stories? Behrendt’s message on this is piercing, and delivered, like all the book’s messages, through a revealing example. ‘Law is a national story’, and through story-telling, Olney and others have supported the duress of white claims over Indigenous lands. It would be difficult to overestimate the gravity of Finding Eliza’s lessons. Readers should take a long breath before they confront the strands of colonial power that have a binding grip on white psyches, and touch the structural corners of the settler nation that is Australia; invasion, violence, cultural appropriation, and land rights, no less. [i] ‘The Rollicking Adventures of Eliza Fraser’, http://www.imdb.com/title/tt0074466/, accessed 5 May 2016. [ii]Tracey Banivanua Mar, ‘Cannibalism and Colonialism: charting colonies and frontiers in nineteenth century Fiji’, Comparative Studies in Society and History, 2010, Vol.52(2), 255-281; See also Ian J McNiven, Lynette Russell and Kay Schaffer, Constructions of colonialism : perspectives on Eliza Fraser’s shipwreck, Washington, D.C : Leicester University Press, 1998. [v] Behrendt, Finding Eliza, 99. [vii] ‘Case Summary: Yorta Yorta v Victoria’, August 2005, http://aiatsis.gov.au/publications/products/case-summary-yorta-yorta-v-victoria, accessed 1 May 2016. NADIA RHOOK is a Melbourne-based historian and writer, published in Postcolonial Studies, the Journal of Women’s History and Peril: Asian Australian Arts and Culture Magazine. She’s currently curating a City Library heritage exhibition, ‘Moving Tongues: language and difference in 1890s Melbourne’.